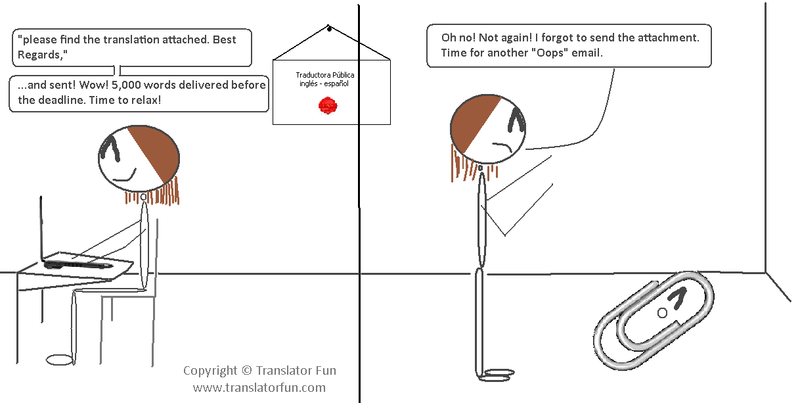 Translators’ nightmares series: Oops, I forgot the attachment. Oops, I forgot the attachment — click on the image to enlarge. See this comic strip in Spanish. Is this also one of your nightmares as a translator? Does this happen to you very often? Share your story! This entry was posted in Best practices, Freelance translator, Fun, language, lifestyle, Translation and tagged attachment, best practices, email, file, nightnares, project, translation by Romina Bona. Bookmark the permalink. My trick to not forget to attach files is to attach them as soon as I write “Attached please find…”. That way, it’s done and I can focus on the rest of the e-mail without having to worry about remembering to do it before hitting “Send”. Happens quiet often, especially when you want to relax after a tiring job. You send, sit down, enjoy your time and bumm! You suddenly realise you didn’t attach the file. Attach the file first, then concentrate on composing an e-mail message. Luckily, I use Thunderbird as my mail program, and this nice little program reminds me when I write something like “CV” or “Attachment” that I have not attached anything…. saved me quite a few Oops mails!